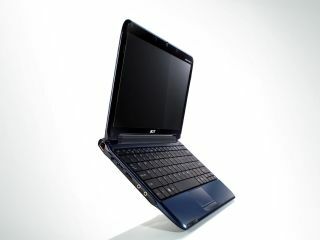 The Acer product announcements keep on rolling, with news that the company has updates its netbook range. The Acer Aspire One has been given a bigger screen. At 11.6 inches (up from 8.9 inches), the machine is now a tad wider and heavier as its predecessor but it is still a svelte netbook. Screen resolution has improved with the introduction of better WXGA resolution and LED backlighting. As with all of today's releases, Acer is tight-lipped on actual specifications. What we do know is that the touchpad is now multi-gesture and the laptop utilises an Intel Atom Processor and Mobile Intel US15W Express Chipset. Internet connectivity is well catered for, with the inclusion of Wi-Fi and 3G, and despite its diminutive size, there's room for a 160GB hard drive. Price and street date is still to be announced, but while you are waiting on confirmation, you can decide whether you would like the netbook in black, white, red or blue.